This 2013 documentary directed by Jennifer Steinman follows a group of non-professional runners as they attempt to complete The 4 Deserts "Grand Slam," a series of ultramarathon races often considered the most difficult in the world. Their journey takes them to four different continents, through unspeakably beautiful landscapes, while pushing their minds and bodies to the limit. Desert Runners is a deep look into the psyches of endurance athletes, and the ways humans cope with heartbreak and achievement. The feature was funded primarily by partnerships with brand sponsors (Juice Plus, Clif Bar), as well as a Kickstarter campaign in which 322 backers pledged over $33,000. It screened at festivals worldwide in the summer and fall of 2013 and had a television broadcast on DirecTV's Audience Network in November 2013, followed by physical distribution on DVD and digital via major VOD channels. Direct sales from desertrunnersmovie.com were powered by Vimeo OTT. The film's director and producers teamed up with BOND/360, who decided to ally with athletic- and health-focused nonprofits whose networks overlapped with Desert Runners' target audience. They spent one month per partnership with organizations including Save The Children (food, health care and education for impoverished children), Athlete Ally (LGBTQ inclusivity in sports) and the Ronan-Thompson Foundation (children's cancer research). 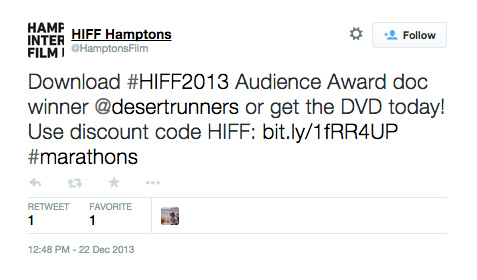 TheDesert Runners website was branded with the organization's logo, and the film was sold on a pay-what-you-want sliding scale up to $200 where any money spent over the base retail price would be donated to the partner charity, thereby incentivizing the charities to promote the film's website to their own networks. 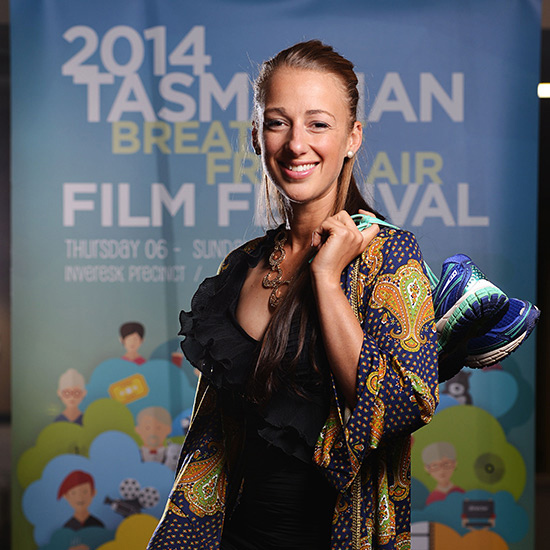 The filmmakers saw that people who'd already bought the film came back to the site to donate to the charities. Giving fans a reason to continue to engage with the Desert Runners strengthened both the brand of the film and the enthusiasms partners had for the cross-promotion. Outside of charities, Desert Runners' star Samantha Gash and director Jennifer Steinman will be hosting screenings and participating in Q&As at REI, which is mutually beneficial in that REI has access to edifying programming for their community, and Desert Runners gets new exposure from people within their target audience. As part of this partnership, REI will send an email blast to thousands of subscribers with a discount code to save $1 on the digital download of the film from the Desert Runners website. Sam, one of the runners featured in the documentary, signed on for an amazing challenge — Running the 1,000 mile Freedom Trail through South Africa to raise money for Save the Children. The focus of her personal campaign was to support that nonprofit in efforts to start a new business in South Africa focused on bringing sanitary supplies to women in need. Sam was so invested in this cause that she brought her own fan base of followers and used Desert Runners as a platform to catalyze their engagement. The campaign was launched during National Women's Month, giving press and organizations even more of a narrative anchor to talk about the partnership. Sam also did a new video that was added as bonus content to the media available on the Desert Runners website. Ongoing press coverage has been essential to continuous monthly revenue. Since the release, the Desert Runners team has created dozens of different custom discount codes for blogs, magazines, and running enthusiast groups to dispense to their readerships, members, and social networks during time-limited promotions and flash sales. The team can see in the Vimeo OTT dashboard which coupons caught on successfully in order to help them track what outreach efforts are most effective and plan their next moves. PAY ATTENTION TO WHAT'S WORKING TO KEEP THE MOMENTUM ALIVE. Pay-What-You-Want - Allow fans to pay more to support you or to donate additional funds to a charity. Discount Codes - Coupons let publishers run flash sales on their content. This creates demand and gets social media juices flowing freely. Screeners - Send time-expiring screeners to key recipients and know when they've opened it.